Free Fax To Email for government. South African . Signing up to a South African government free fax to email number is quick and easy. How does someone send a fax to a fax to email number? 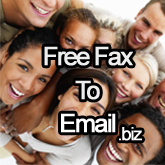 Is Free Fax To Email really free? Yes, free fax to email is free to you, the receiver, the South African . However, the sender does pay the Telkom "Fax To Email" rates, which is higher than normal phone call charges. The rates are reasonable and the cost to send a fax is affordable and cheap. The benefits of receiving your faxes in your email outweigh the costs.